25 | January | 2016 | Health Promotion Ideas: Let's Get Healthy! Sometimes we take for granted the benefits of developing our community connectedness. To feel like we are part of a community, there are so many different things that we can do. As someone who has experienced moving many times as a child, as an individual, as well as a parent & spouse, I have learned a few things along the way. Choosing to diversify one’s efforts to develop connections in the community provides for broader connectedness. Not only are there many things one can do to become connected to their community, there are different hopeful expectations for each of these things. Meeting one’s neighbors who live close by is one of the most expected ways to become part of one’s community, but neighbors may or may not be the same people that we interact with when we attend school as a child, when we work as an adult, or when we attend events in the area that we live in. Therefore, despite the likely commonalities for people to live in the same neighborhood, there may or may not be enough interactions that cause neighbors to meet. This is why I intentionally try to meet my neighbors to introduce myself, to discover more about them & their interests, & to initiate an openness to connect with them. Some community connections, such as building relationships with neighbors, have the potential to lead to other connections, such as establishing a walking group on local trails. The hopeful expectations for joining an established group that has similar expectations from group members are different compared to an independently created group, such as a neighborhood community. This is true when we join a faith-based group, a social club, or a fitness center. Depending on the size of each of these established groups, there may be additional subgroup opportunities available that help us to find people who have very similar interests as us. This is why I intentionally try to find more than one established group with which to connect, in order to meet people with varied interests. 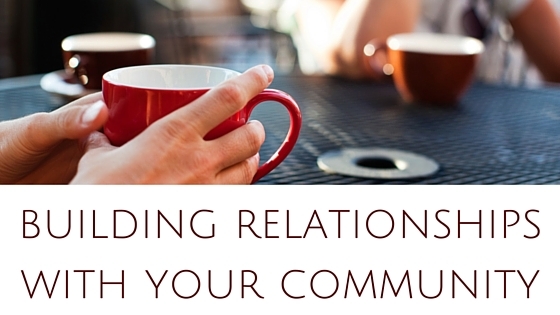 Some community connections, such as building relationships with people who we have discovered have focused-interests similar to our own interests, have the potential to build strong connections. In contrast, the diversity of community connections, such as is possible when relationships are built with multiple established groups &/or subgroups, has the potential to lead to a stronger overall connection to the community as a whole, rather than to the group itself. Community connectedness can be developed in many different ways & hopefully incorporates many different levels of relationship building. Although successful community connectedness may look different for all of us, we all have the potential to learn from each other & from each community that we join. How are you connected to your community?